Having seen some of the online set videos (I think...) I'm fairly clear about setting up the equatorial wedge onto my tripod to capture the latitude: You point the adjustment knob twowards the north, then adjust the latidude indicator to your latitude (which for London is 51°30′N). 1. If you're aiming to capture the transit of Mercury, do you still need to polar align? I've brought myself a copy of an app for my iPhone called PolarAlign just in case. How do you do this during the day? Or is it just a matter of adjusting the time graduation circle, the date graduation circle and the standard meridian offset scale to match the information within the app? 2. Assuming that you've now set up the mount, how do do you get it to solar track? I know where the selector is on the mount, but is this essentially just the speed of movement? Is it the polar alignment that makes it follow the correct arc of the sun? 3. As mentioned above, I'm planning on mounting a Nikon D700, with a Nikon 300mm f/2.8 VRII onto the mount. The kit comes with a counterweight, to balance off the weight of whatever you place onto the mount. How do you know where to locate the counterweight (it slides up and down a rod)? Obviously, since the transit is on Monday, there is a bit of urgency, either way, thanks in advance for any help that you can give me. I wouldn't worry too much. Although the sun is 'moving', the brightness of the sun - even with a filter on it - means that it it won't move enough to cause problems with the kind of exposures you will be using. This device would of course track the sun if set up correctly, but the sun isn't a difficult target to locate! If you still want to set it up, then I am certain you will need to polar align it. You may need to align it at night and keep it in position for the next day. A counterweight is literally that. Mount your camera and slide the weight across until the balance in on the unit itself. With such a small unit you could lift it by hand and move the weight until it balances on your hand. If anyone here has got one of these, hopefully they could give you more precise advice. Sorry about the 'automatic moderator' on this forum software. It restricts the things you can do until you prove to it that you are a genuine contributor. It is a bit paranoid until you have made a dozen or so posts! Thanks for the reply Aratus, I really appreciate it. My plan is to try to capture around 37 images of the sun and then combine them so that I have a composite showing the transit of Mercury across the face of the sun. Although I will be controlling the exposures (sitting in a deckchair for seven hours basically on Primrose Hill in London) I do want it to move automatically and track so that the sun stays centered perfectly in the viewfinder. Because London has such bloody awful light polution at night, combined with the current cloud cover, I'm still stumped as to how I do the Polaris alignment thing (most nights I can't even find Orion - one of my favourite constellations) so if you or others can offer any help on this, I'd be very grateful. cloudwalker_3 wrote: Although I will be controlling the exposures (sitting in a deckchair for seven hours basically on Primrose Hill in London) I do want it to move automatically and track so that the sun stays centered perfectly in the viewfinder. To be honest, I think most 'simple' mounts would find it a push to remain centred exactly over 7 hours, so I think it would be more realistic to assume you'll be manually aligning the images afterwards. If you can get your tripod leveled and the angle more or less right on the equatorial mount, and a compass to find north, you should find that you'll only need to make small alterations before each image. Good luck though. We're at Astrocamp in S Wales, and the forecast isn't great for Monday. Learning your way around the sky is a slow but rewarding process. Finding polaris is fairly easy. Orion is not always in the night's sky but another constellation will help you. 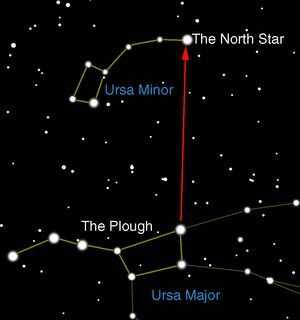 'The Great Bear' has a collection of stars sometimes called 'The Plough'. This is always visible in the clear night sky. You use the 2 stars at the end to 'point' to the Pole Star. This image shows how to do that. and this web page explains it. All the best for Monday everyone! Thanks for that information Gfamily2, very helpful. I've seen a video on setting it all up it's on YouTube (after the web address typ a slash / watch?v=g58TqYUbhWY and you'll find it). I'm using the wedge seen in this video which I've set to the London latitude (51.5º N). In terms of finding Polaris, given that the light polution here is so awful, having done this, and based on the fact that I'm tracking the Sun is it now just a matter of aining the mount north and turning it on? Or am I missing something in your reply? Good luck with Monday, either way. Having found it however (with the augumented reality part of the app it just points you towards it in the sky) it was pretty faint (due to the light polution) but I definitely found it. It was pretty easy with the app. I also have the PolarAlign app on my iPhone. I figured by using both these apps together I've got to be able to work out how to set up the alignment, right? Looking at all the stuff and trying to work out the manual (which is fairly difficult) has just left me utterly confused. It's probably not aided hugely by the fact that I'm dyslexic and dyspraxic either. Numbers 1 - 24 will be what is known as 'Right Ascension'. It is equivalent of 'Longitude' in the night's sky. 0,3,6,9 might be 'declination' which is the equivalent of 'latitude'. (actually 0 - 90 degrees) So these are different coordinates. The orientations look as if they are the various possible views through a telescope. If you are using a camera lens then I'm guess you need to use 'corrected'. In other words the image is 'the right way up and not 'flipped''. This is an educated guess, and may be wrong, but I figure it is worth a try. If anyone else can understand this better then please chip in. Remember that you will be able to take photos of the transit without the mount so it is not urgent. Once you have mastered this mount you will be able to image plenty of deep sky objects which require a long time exposure.